Go Pinterest-ing, Ransomware Threats, More! 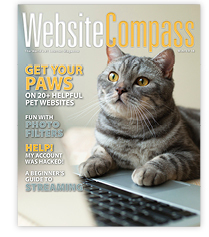 The internet is packed with resources for pet parents, and you'll find many of them in the Winter 2018 Website Comp e-magazine. Its feature article is a doggone good place to start if you'd like helpful tips on caring for dogs (or cats) as well as other pet information. You'll also find a beginner's guide to streaming, fun photo filter ideas, and advice on protecting yourself from being hacked. You receive Website Compass as a value-added bonus (and thank you gift) for being one of our internet customers You can also access Website Compass at this link. What's super scary and super cool all at the same time? Two scuba divers filming a curious hammerhead shark. Frugality drove this artist to find a different way to paint, and he now creates beautiful images with Microsoft Excel! Upgrade Today And Save Up To $240 For One Year! 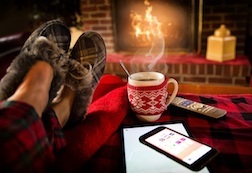 Now that Santa's work is done, we're sure you've got lots of new Wi-Fi hungry, Internet-connected gadgets around the house, whether it's a new smart speaker like Amazon Echo, a new iPad, or just about any kind of electronic device. It may be time to upgrade your Internet! Good thing 3 Rivers has Internet service you need to power your family's video streaming, allow lag-free gaming, video chat and more on all your new screens, all at the same time! Call 3 Rivers or visit 3rivers.net for information on how to upgrade to faster Internet today and save up to $240 for one year! Like a friendly personal assistant, this app can help you plan your day, remember appointments, and make or share idea lists. Test your consumer savvy with this game that has you guess the logos of more than 1,000 brands. Stuck? Ask for a fun hint. (iOS only) Aspiring interior designers will love this app, which allows you to "place" furniture or other virtual objects in your home. sundance.org – The world-renowned Sundance Film Festival will take place this year January 18 through 28 in Park City, Utah. The festival is presented by Sundance Institute, a nonprofit organization dedicated to the discovery and development of independent artists and audiences. Visit this site to learn what's new this year and how to attend. eatingwell.com – Keeping New Year's resolutions is tricky, but having the right resources can help. Complete with videos, the EatingWell website is a great healthy eating companion with articles and recipes for a wide variety of food-related goals including losing weight, sticking to a special diet, or simply planning meals ahead. health.com – Exercising, eating healthy, getting enough sleep, and washing your hands are good pieces of advice any time of year, but especially during cold and flu season. Visit this site to read more about these tips and many others to help you stay healthy this winter. fathomaway.com – Take yourself out of the winter doldrums by visiting this site and dreaming about your next trip. Know where you want to go? Click the Destinations tab and learn more about the area you want to visit. Not sure? Click the Inspiration tab to get ideas based on why you love to travel. Short Tutorial/FAQ – What Internet-Related Terms Have Been Added Recently To The Merriam-Webster Dictionary?